Witnesses to a mystery on the battlefield, a British medic and an American Navy SEAL confront Afghanistan's fog of war. Elinor came to Afghanistan with the hope of changing hearts and minds: What she's about to discover will make her question everything she ever believed about love and war. A war thriller. A cross-cultural love story with an undercurrent of magic realism. 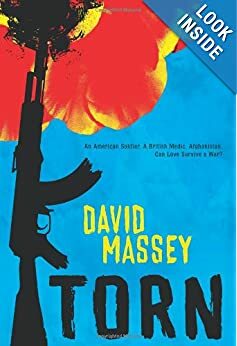 A powerful debut set in modern-day, battle-scarred Afghanistan. This is Torn . David Massey's varied career has taken him from teaching and music journalism to presenting, producing and writing for radio. As the Romanian revolution was ending, David led a team taking supplies to Bucharest and Timisoara. On the way home he stopped near Checkpoint Charlie to help chip holes in the Berlin Wall. Rather fittingly, David and his wife Debi now run Globehuggers Emergency Supplies - a business specializing in bespoke grab bags and emergency equipment. David debut young adult novel TORN will be published in August 2013 on the Chicken House/Scholastic label. TORN has already won the Lancashire Awards Book of the year 2013 and has been nominated in the UK for several other awards including the prestigious Brandford Boase, Leeds Award, and the Coventry Inspiration Award. David's second novel TAKEN is released in the UK in March 2014. This is the type of book that will take you on an emotional roller coaster ride. While the topics being covered are heavy, the author presents the topic and the story well and helps the young teen reader understand what is being shared in a way that respects the reader. The author also brings up the topic of death in this book and the number of causalities in the war. While at first I wondered how he would present this, I am pleased to say that he did it with complete respect and shares this through the eyes of a character that lived the experience and can share it in a way that is unlike any other character can. The author also creates a world that is completely vivid and you find yourself surrounded by the sights and sounds of the war. The book draws you in from the beginning and keeps you engaged until the end, especially as you do not know what will be coming next. I have to say that after reading this I have a much greater respect for people who have or are living in countries like this as I cannot even imagine a life like this, but have admiration for those who have survived and thrived even through such trials and tribulations. Though this book does have some heavy topics, the book also is full of adventure, mystery drama, friendship and more and in the end you will be drawn into the lives of the characters and the hope that they continually strive to hold onto.